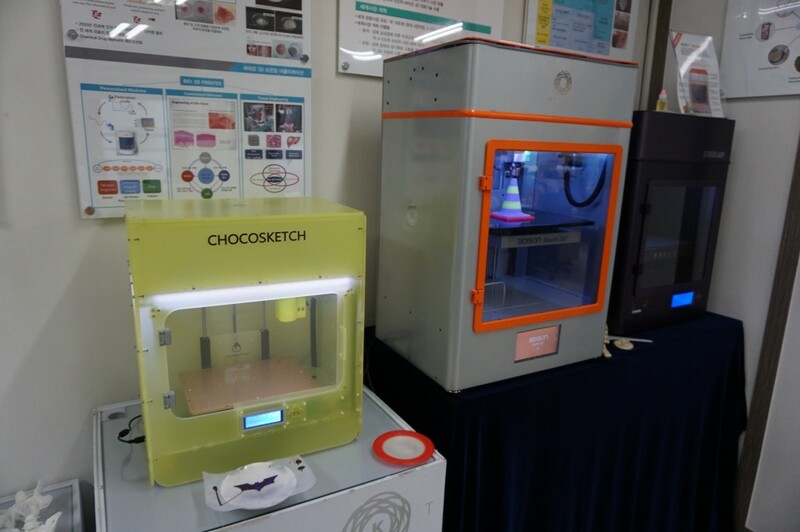 Last month we got the chance to visit the headquarters of Rokit in Seoul South Korea. 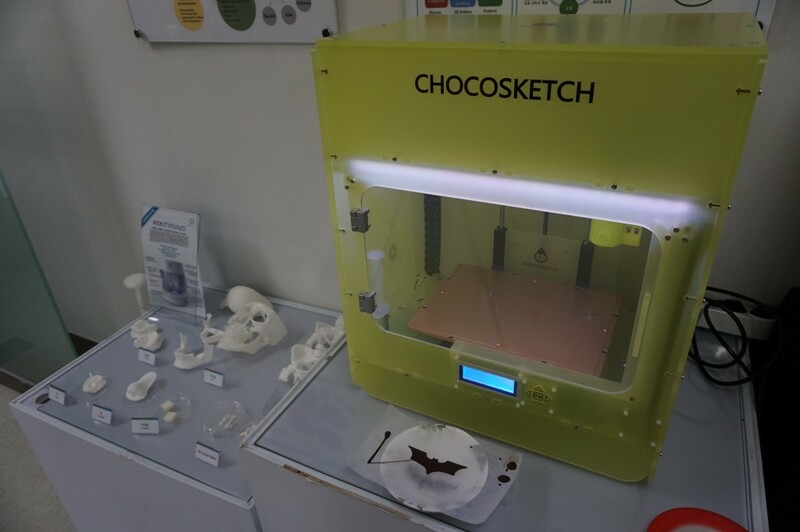 Thanks to Shane we got to know more about the and their 3d chocolate printer, Chocosketch. During our visit we got the chance to see the printer in action, taste its prints and get an overview of the features. The Chocosketch is the chocolate Desktop 3d printer from Rokit. 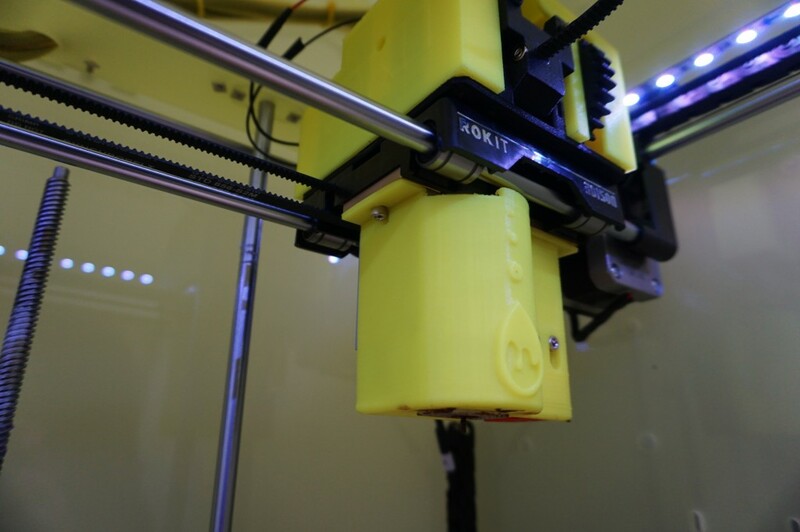 Rokit is a South Korean 3d printing company with printers that range from desktop to professional. 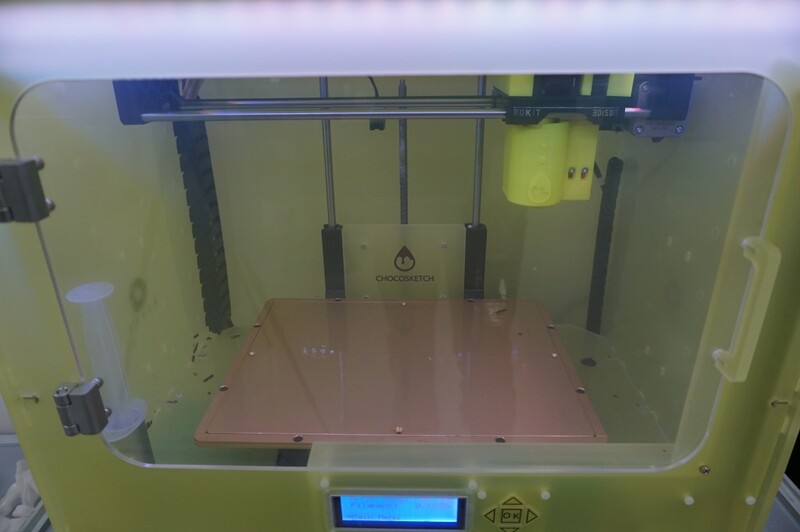 The build up volume for the printer is 210 x 120 x 70 mm, and the overall dimensions are 454 x 300 x 500 mm. It has a clear door locked with magnets for easy access to the interior. 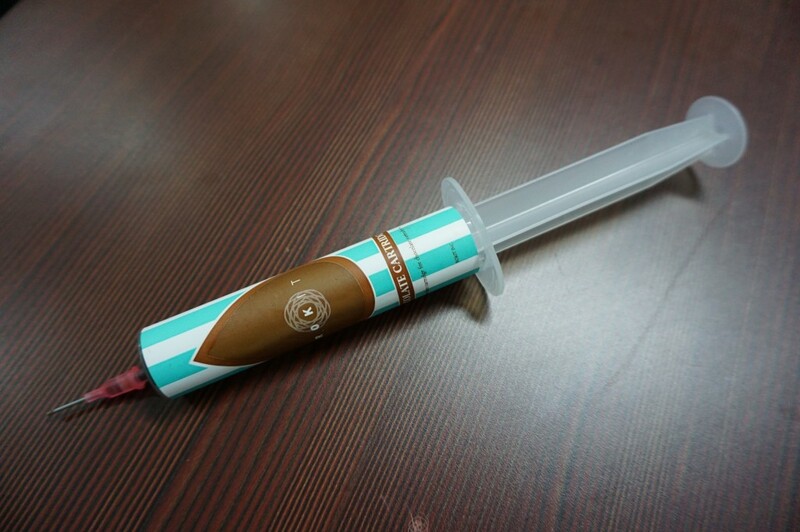 The printer works with syringes filled with Chocolate. Rokit provides 3 types of chocolate that has been tested. Those are white, milk and dark. 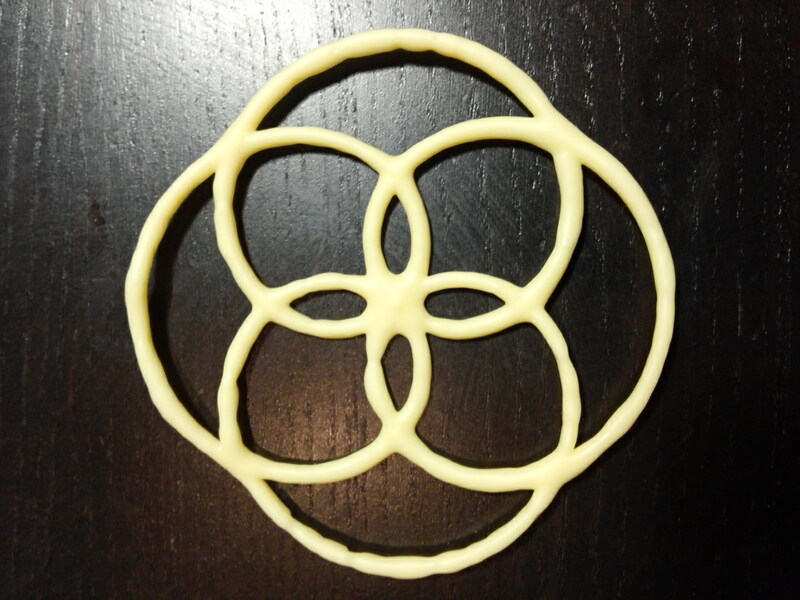 You can use your own material although you would need to tweak the configuration parameters to make sure it works properly. 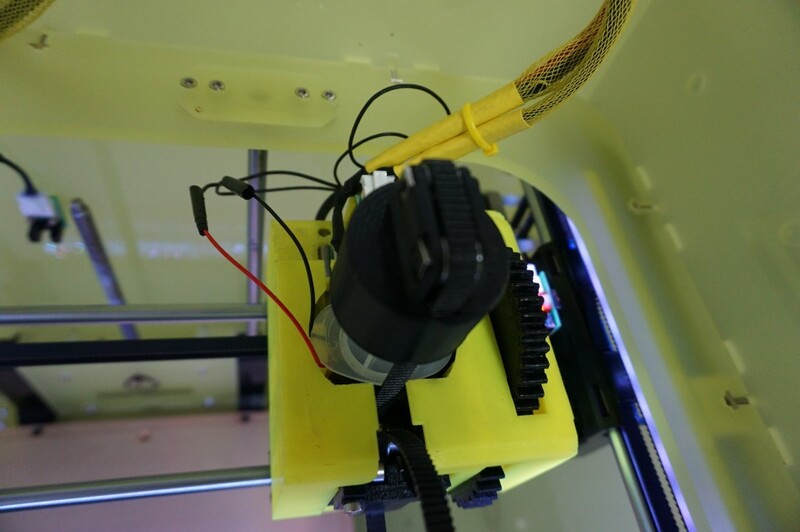 The printer has a preheat station in the inner left side of the printer, where cartridges can be preheated while printing. 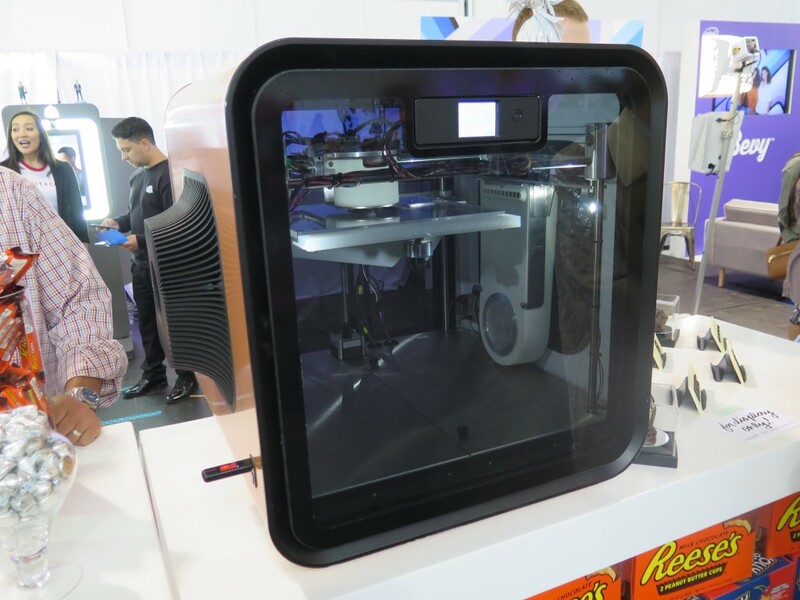 This is especially good if you plan to print multiple or big items that might require more than one syringe of chocolate. The build plate is made out of stainless steel, what makes it pretty easy to wipe out. Although It is fixed, so don’t expect to pop it into the dishwasher. Pro tip: for that use some cooking or wax paper, pro tip use some oil to stick it to the plate. 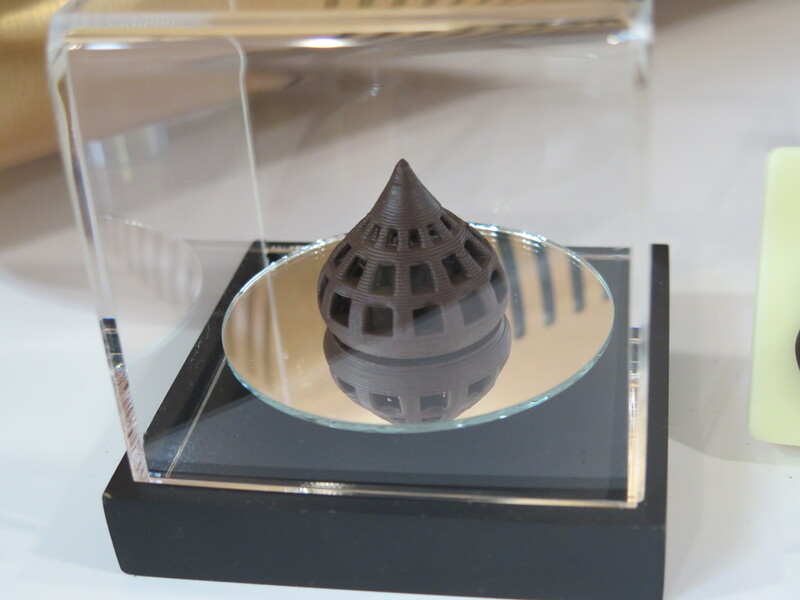 3d chocolate prints are possible by controlling the temperature. For that the the Chocosketch has a fan that forces air circulation. There is no active cooling system . Proper air circulation makes sure the chocolate sets and the nozzle does not get clogged. 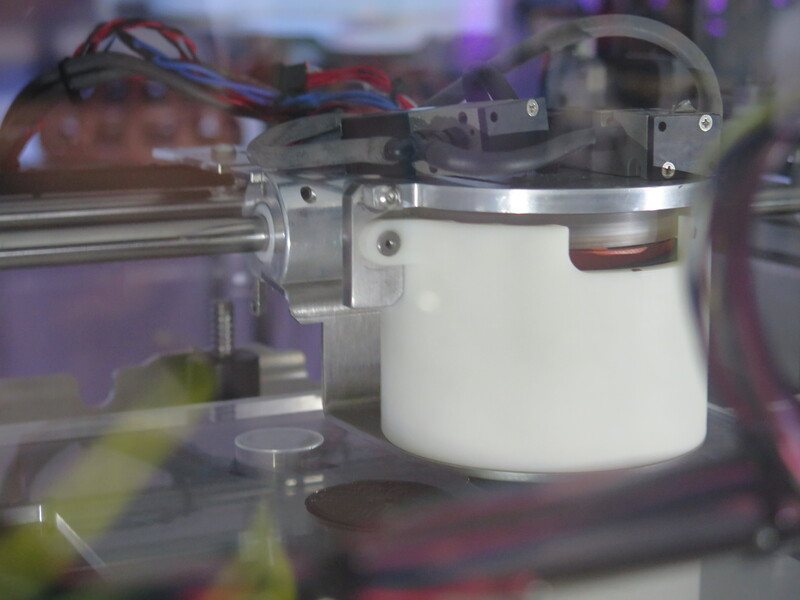 The printer has a removable top for easy access to the extruder, to load and unload the syringes. The extruder itself works similarly to the RichRap syringe extruder, where a belt pushes down the plunger. Obviously it includes a heating system that keeps all the syringe warm including the nozzle. There is 3d different ways to send files to the printer. Using WIFI, USB or SD-Card. The printer retails for about 2100$(depending on the country) and each preloaded syringe for about 5$. For more information make sure to contact with Rokit. Thanks Rokit and specially Shane for letting us visit and get a closer view of the printer. CocoJet first look. Great surprise for the day. 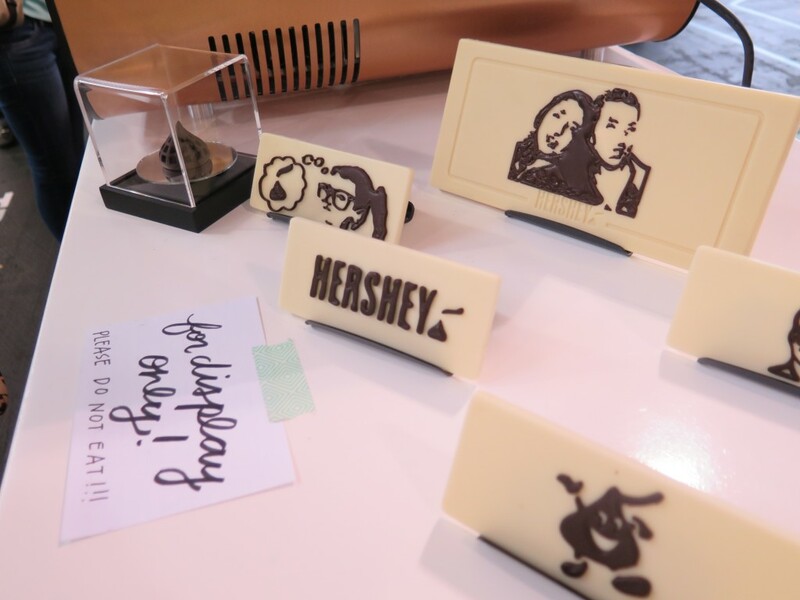 Thanks to a tip, we got to know that Hersheys was showing their CocoJet printer at Remake San Francisco.Without hesitating we head there and meet the great people from Hersheys and the CocoJet. Here a video of the printer in action. Special thanks to Jeff and Robert for answering patiantly our crazy questions. We were super excited! 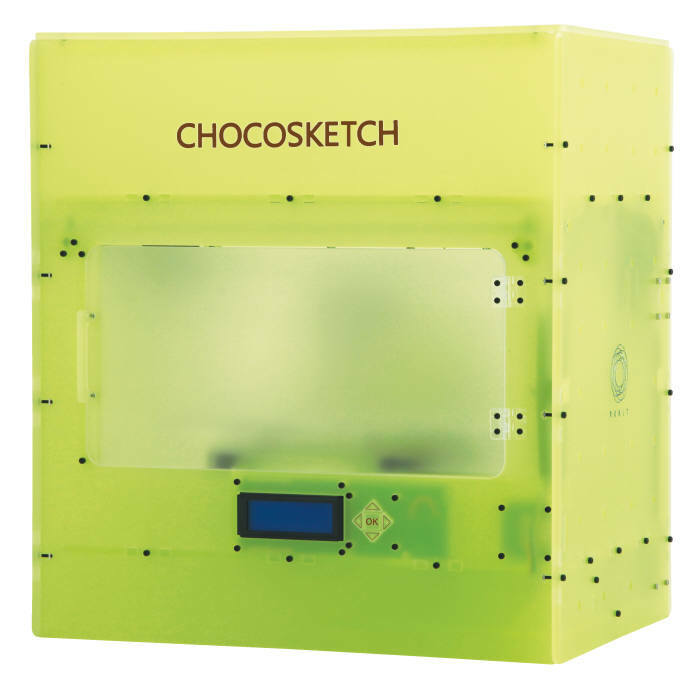 Choco Sketch it is a new 3d Food Printer announced by Rokit. It is exclusively design for chocolate. Here you can see a short video highly marketingized but with a Yoda printed sample. More info on their Facebook and website! Not much info about it, expected price is 2Million KRW what it is around 1600€. Seems their paste extruder would be available too. Printing with chocolate tends to end up in a completely mess at 3DC #HQ. 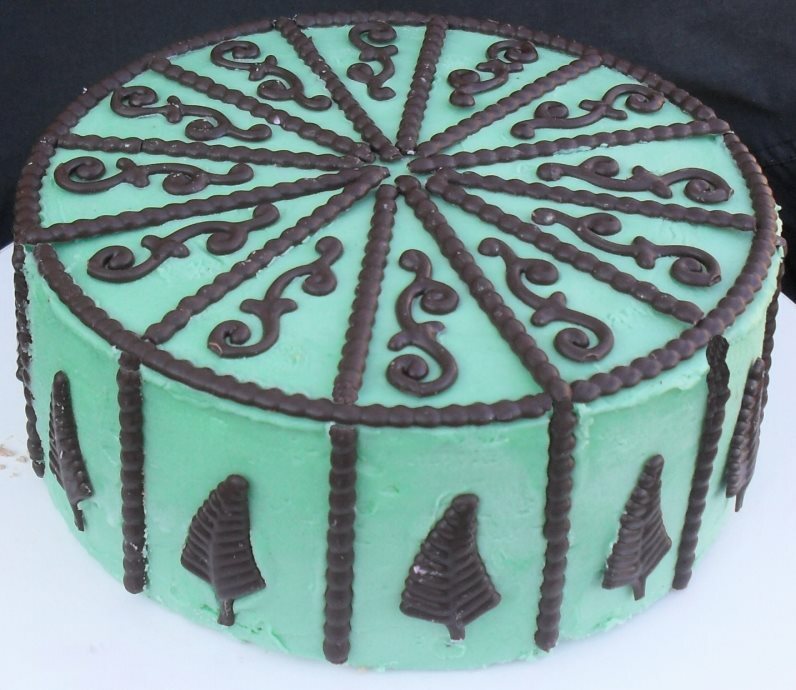 Here are some printing tips for chocolate that we find useful for our doilies prints. Prepare all your printing files in advance! To melt the chocolate using the microwave is preferred. Our “technique” relays on counting 15 every time the choco is heated up. Heat and stir as much as you need to melt all the chocolate. Stir in between heating runs. Load the syringe, adjust the air pressure and hit print! 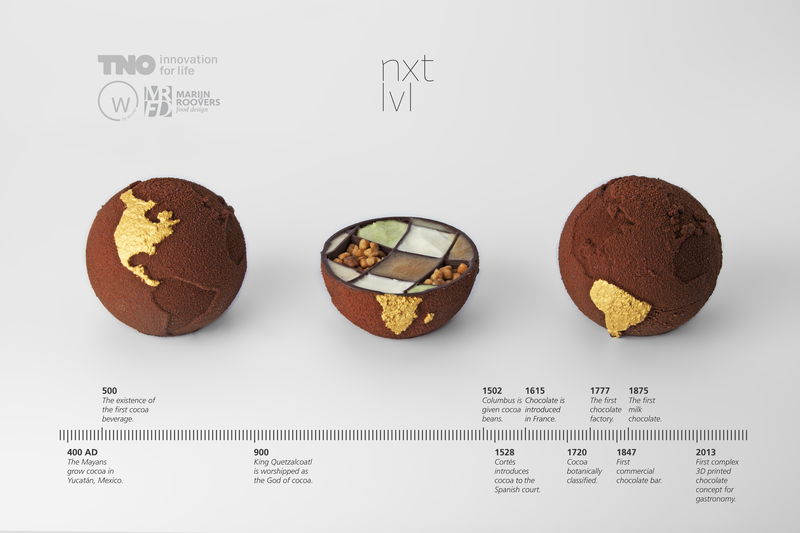 From Wouter van Laarhoven a really cool video showing the printing process for their complex 3D printed chocolate aka 3D printed chocolate Globe. A new interview @3DigitalCooks, this time with Hans Fouche. I must admit the only thing I knew about him was all the buzz behind Chocnology. But after this interview, you will see there is so much more. 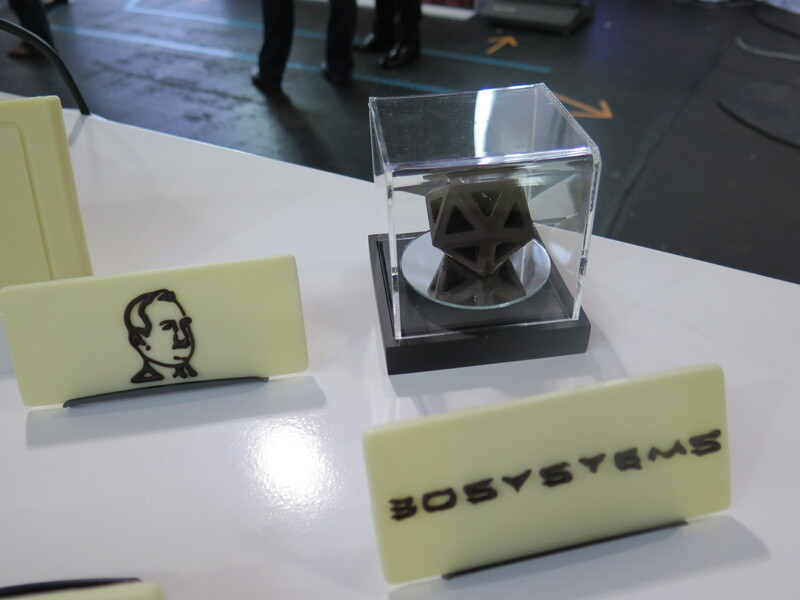 F1 engineer, pioneer printing chocolate, maker and businessman. Enjoy!